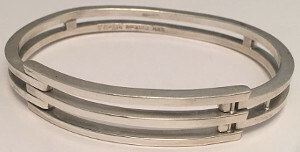 Sterling Silver Bangles in various designs manufactured from Sterling 925 Silver. Plain Silver Bangles with engraved designs, open end torque bangles, Silver Expanding or Baby Bangles, hinged Bangles and many other Bangle design. 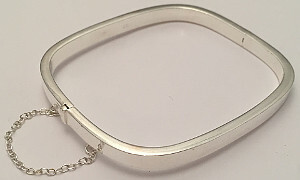 Sterling Silver hinged Bangle with safety chain attached. STERLING SILVER BABY BANGLE expanding with Dolphins design. Solid sterling Silver Baby Bangle. Adjustable size approximately 120mm - 160mm circumference. Wide Studded Sterling Silver 925 UNITED COLORS of BENETTON Bangle. Holed Studs design wide Designer Silver Bangle. 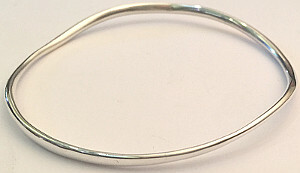 Hook and Loop clasp Sterling Silver .925 solid Bangle. Mens Heavy Sterling Silver Boxing Gloves design Bangle. Boxers fists with gloves ends open solid Silver Gents Bangle. 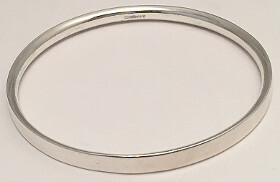 Sterling Silver hollow rectangular bangle with rounded corners and flat edges. 4mm wide hinged bangle with safety chain attached and tongue style clasp. Internal dimensions approx. 60mm x 52mm. 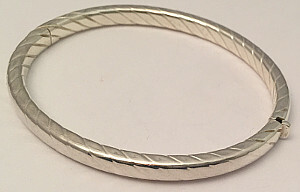 Sterling Silver hinged round edged wavy hollow Bangle with polished finish. Large size Sterling Silver hinged hollow Bangle, 8mm wide chunky oval hinged with tongue secured clasp bangle. Approximately 65mm x 55mm diameter. 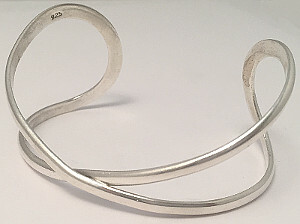 Sterling Silver Bangle in Classic Wavy shaped Design. 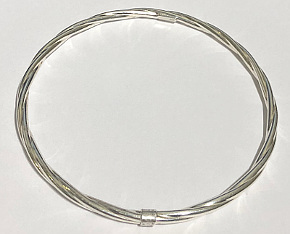 Sterling Silver bangle with double Coil effect detail design finish. 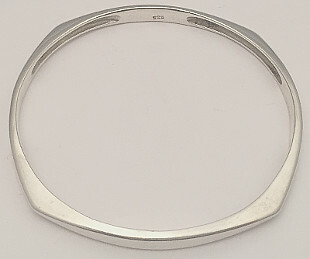 Hollow 925 Silver Bangle with interesting design, push tongue securing type. Sterling Silver solid Round Bangle with flattened edges design, 66mm internal diameter. 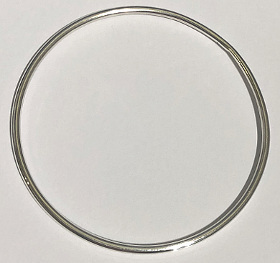 Sterling Silver 3mm wide round bangle, approx. 65mm internal diameter round bangle. 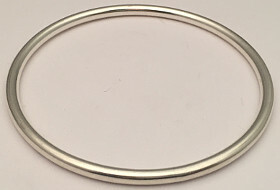 Sterling Silver 2mm wide round bangle, approx. 65mm internal diameter round bangle. Solid Sterling Silver wavy Snake shaped Bangle, cross-over snake solid 925 design. Sterling Silver hollow hinged bangle with elliptical shape edge and securing clasp. Approx 60mm x 55mm diameter. 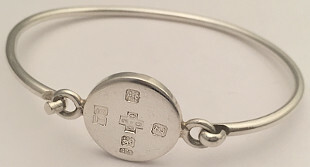 Sterling Silver Bangle with large visible hallmarkings including central Cross Millenium Commemorative 2000 Hallmark. Open ended 9mm wide MILLENIUM HALLMARK Commemorative solid 925 Silver Bangle. Full set of Silver Hallmarks around outside of Bangle including 2000 Cross mark in centre. 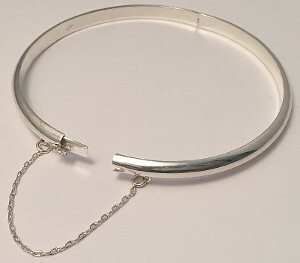 Sterling Silver wide open ended Cuff style Bangle. Extra wide solid Sterling Silver Split design Cuff Bangle. 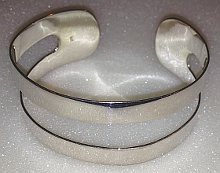 Large 25mm Wide Cuff Bangle in solid 925 Silver with designer double band split style. 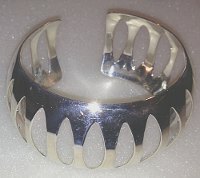 Sterling Silver ladies bangle with designer Cut shapes all around bangle body. Rounded design 32mm wide Designer Elegant open ended Bangle, approx. 60mm x 50mm diameter. 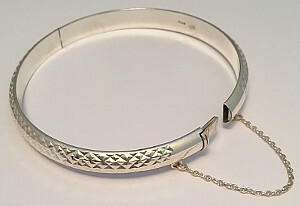 Sterling Silver hinged Bangle with Diamond Cut textured design and attached Safety Chain, 7mm wide. Sterling Silver Solid round Bangle with Feature Hallmarks spaced around bangle exterior. Internal diameter 60mm. The hallmarks are displayed in four places equally spaced on the outside of the 6mm wide solid bangle. 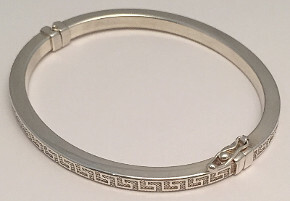 Sterling Silver Greek design hollow Bangle with securing clip clasp. 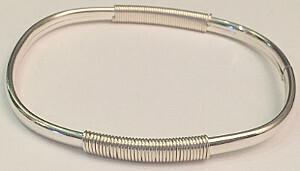 Popular Greek design spring closing 4mm wide bangle with securing clip. Internal dimensions approx. 60mm x 52mm. Sterling Silver hinged Bangle with Belt Buckle design securing Clasp. 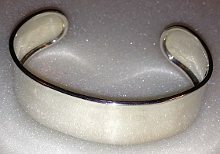 Ladies 5mm wide solid 925 Silver hallmarked Bangle with Unique Belt Buckle style design pressure Clasp. Internal diameter approx. 65mm x 50mm. 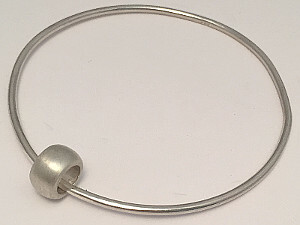 Sterling Silver round Bangle with large Satin finish Silver Bead attached. 925 bangle internal diameter 65mm, Satin bead size approx. 7mm. Sterling Silver 33mm wide Bow crossed design open Ladies Bangle. Fitting internal size approx. 65mm x 50mm. 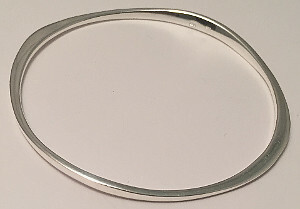 Large 925 designer bangle made from 4mm wide Sterling Silver and extending to 33mm wide at widest point of bangle. Wide Sterling Silver Ladies Bangle with Rope engraved design around whole bangle. Elegant design approx. 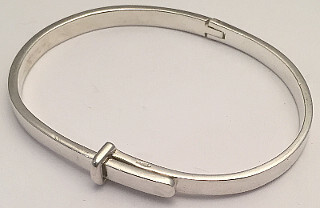 5mm wide 925 hinged hollow bangle with tongue type securing clasp. Approx. internal diameter 60mm x 50mm. 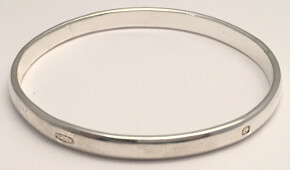 Plain round Sterling Silver hallmarked Bangle 5mm wide. Classic bangle with rounded inside and flat outside surface. Approximately 65mm internal diameter. Commemorative MILLENIUM HALLMARK TAG Sterling Silver Hook and Loop securing Bangle. Round 18mm wide Tag in centre of bangle with Large Millenium 2000 commemorative Cross Hallmark, limited Edition hallmark. Internal fitting diameter approx. 65mm x 54mm. Large Sterling 925 Silver Armlet. Arm Bangle torque style Sterling Silver. 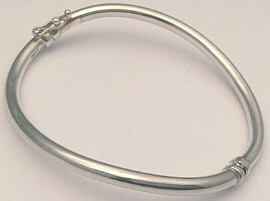 Armlet with ball ends in Sterling Silver Large. 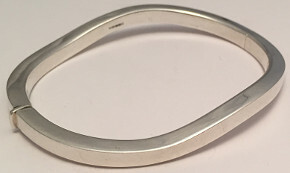 Square corners Sterling Silver large Bangle. Elegant simple design with rounded edges and squared off corners in heavy 925 Silver. Internal diameter approx. 65mm. Sterling Silver expanding design wide bangle in Medium size. 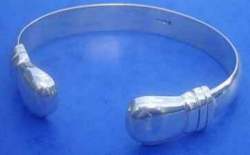 Sterling Silver Arm Bangle Large size Torque Ball Ends Armlet. 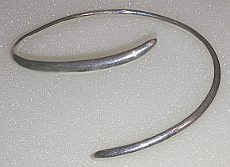 Twisted curve design 925 Silver Armlet, approx 90mm diameter. Sterling Silver solid Wavy design round Bangle, 65mm diameter. 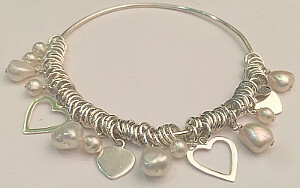 Sterling Silver Bangle set with multiple separate Links, Heart Charms and Pearls. 65mm diameter round bangle set with Silver Hearts, freeform Pearls and multiple round links. Sterling Silver solid oval Ladies Bangle with 10mm wide Split design at clasp, internal diameter 62mm x 54mm.